Closed signs put frowns on the faces of beachcombers and boaters this past weekend at Delaware State Park after the beach and the marina were closed due to the high water level of Delaware Lake. Greg Feustel, a resource manager with the U.S. Army Corps of Engineers, said draining off Delaware Lake’s water level over the weekend was held up due to high water levels downstream. Feustel said the engineers received word Saturday to open the spillway partially allowing for 2500 cubic feet of water per second to escape the reservoir and go downstream of the Olentangy river. By Sunday things had cleared enough to start releasing 4000 cubic feet of water per second. “It was all within our water guide manual,” Feustel said. 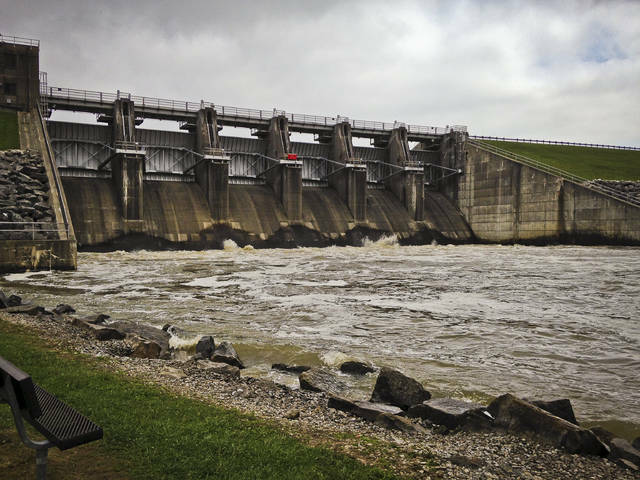 “When we get these big releases, everything comes from Huntington.” Delaware Lake and Dam are part of the Huntington District of the U.S. Army Corps of Engineers, Huntington, West Virginia. Feustel said the lake had risen eight and a half feet before the spillway was opened Saturday. He said the lake had dropped almost 4 and half feet in a 24 hour period. Feustel said the normal level of the 1300 acre lake in the summer is 915 feet with a watershed of 300 square miles north. He said before opening the spillway the lake was at 923.55 feet. “I don’t think we have had anything of this magnitude this summer so far,” he said. Feustel said Alum Creek Lake is three times larger than Delaware Lake and has a watershed of only 80 square miles. He said with Alum being so much bigger it only raised three quarters of a foot total. According to the US Army Corp. of Engineer’s website, the lake is one in a system of dams reducing the flood stages in the Olentangy, Scioto, and Ohio River Basins. The system of dams benefit the lands between Delaware, Ohio and the Gulf of Mexico. The Delaware Lake and Dam project were first authorized by the Flood Control Act of 1938 as part of a larger comprehensive flood control plan for the Ohio River basin. It was designed, built and completed in July, 1948. Delaware Dam and Reservoir is located 32 miles above the mouth of the scenic Olentangy River, a tributary of the Scioto River, near Delaware, Ohio. This entry was tagged Beach, Boaters, Delaware State Park, high water, US army Corp of Engineers. Bookmark the permalink.